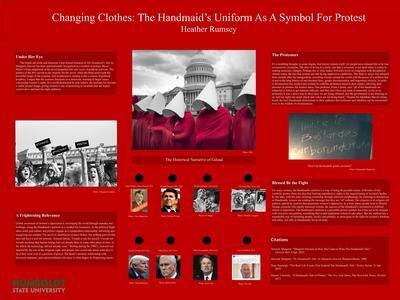 The bright red cloak and fearsome white bonnet featured in The Handmaid’s Tale by Margaret Atwood has been internationally recognized as a symbol for protest. Bruce Miller’s Hulu adaptation of the novel propelled this new wave of activism. I argue that the costume functions as a metonym, reacting to larger issues concerning women’s rights. My final project examines whether the uniform is a viable protest image or is it being co-opted to get people to buy into a certain social and political system?